I’ve noticed a handful of restaurants around our area are offering great pickled vegetables as little sides. There is something about the pickled vegetables that really make many of the entrees shine. Something about the pickling that just cuts through the richness of any dish is right up my alley. 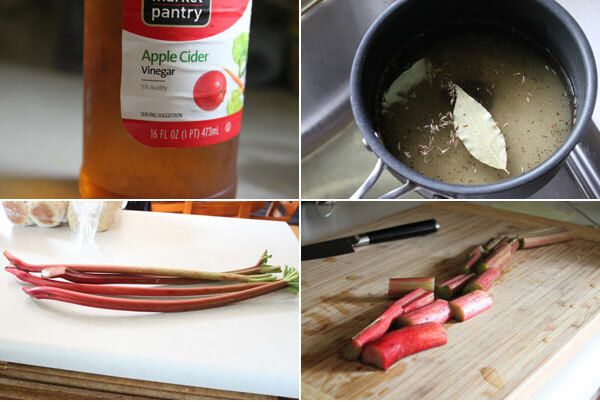 As I noted in my rhubarb simple syrup post, I had picked up a bunch of rhubarb from my favorite farmers, and with some of the remaining rhubarb, I decided to pickle it and see how it was. Did I mention it was awesome? Now you can use your favorite pickling recipe, but I find that the one I am going to share works pretty well. Feel free to balance out any sugar, salt, or other seasonings to your liking. Start by adding the sugar, salt, vinegar, and water to saucepan. On medium heat, bring to a simmer, and cook just until the sugar dissolves, about 5 minutes. Remove from the heat. Next, add in the bay leaf, fennel and mustard seeds, and the black peppercorns. Let this come to room temperature. Next, add the rhubarb spears into your pickling jar. Pour the pickling mixture into the jar and fill to the rim. Cover with the lid, and place in the refrigerator. Now you can eat these in a few hours, but I think they really begin to shine after a few days. They are a bit sweet and tart which is what you would expect, but then you get the pickled flavor that just goes great with any rich type of food. 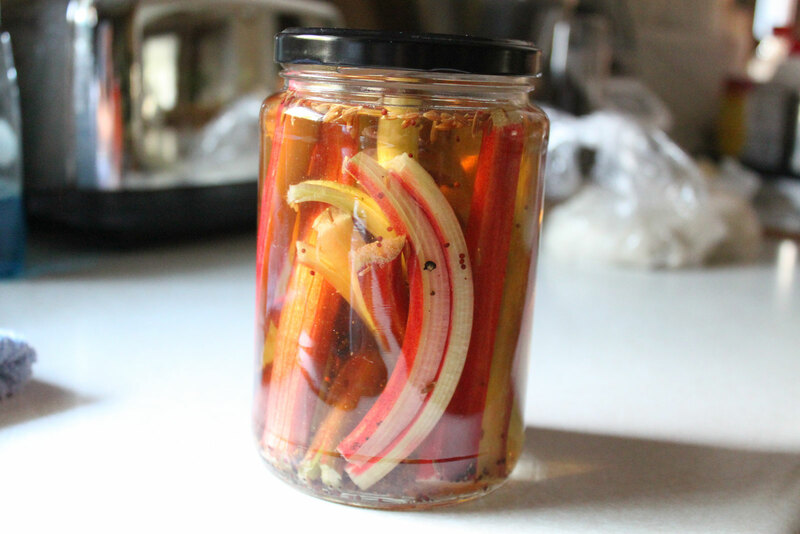 Have you tried pickled rhubarb, and if so, do you like it? For me, they were awesome. Hope you enjoy! Next, add in the bay leaf fennel and mustard seeds, and the peppercorns. Let this come to room temperature.